The dsp.BiquadFilter object implements an IIR filter structure using biquadratic or second–order sections (SOS). Create the dsp.BiquadFilter object and set its properties. biquad = dsp.BiquadFilter returns a biquadratic IIR (SOS) filter System object™, biquad, which independently filters each channel (column) of the input over time using the SOS section [1 0.3 0.4 1 0.1 0.2] with a direct-form II transposed structure. biquad = dsp.BiquadFilter(sosmatrix,scalevalues) returns a biquadratic filter object, with the SOSMatrix property set to sosmatrix and the ScaleValues property set to scalevalues. biquad = dsp.BiquadFilter(Name,Value) returns a biquadratic filter object, biquad, with each property set to the specified value. Specify the filter structure as 'Direct form I', 'Direct form I transposed', 'Direct form II', 'Direct form II transposed'. Specify the source of the SOS matrix as 'Property' or 'Input port'. The coefficients are ordered in the rows of the SOS matrix as (b0, b1,b2,1, –a1, –a2). You can use coefficients of real or complex values. This property applies only when you set the SOSMatrixSource property to Property. The leading denominator coefficient of the biquad filter, a0, equals 1 for each filter section, regardless of the specified value. Specify the scale values to apply before and after each section of a biquad filter. ScaleValues must be either a scalar or a vector of length N+1, where N is the number of sections. If you set this property to a scalar, the scalar value is used as the gain value only before the first filter section. The remaining gain values are set to 1. If you set this property to a vector of N+1values, each value is used for a separate section of the filter. This property applies only when you set the SOSMatrixSource property to Property. Specify the initial conditions of the filter states when the Structure property is one of | Direct form II | Direct form II transposed |. The number of states or delay elements (zeros and poles) in a direct-form II biquad filter equals twice the number of filter sections. You can specify the initial conditions as a scalar, vector, or matrix. When you specify a scalar value, the biquad filter initializes all delay elements in the filter to that value. When you specify a vector of length equal to the number of delay elements in the filter, each vector element specifies a unique initial condition for the corresponding delay element. 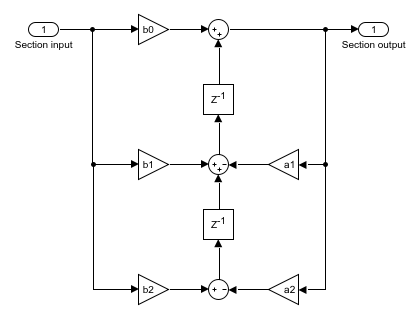 The biquad filter applies the same vector of initial conditions to each channel of the input signal. When you specify a vector of length equal to the product of the number of input channels and the number of delay elements in the filter, each element specifies a unique initial condition for the corresponding delay element in the corresponding channel. When you specify a matrix with the same number of rows as the number of delay elements in the filter, and one column for each channel of the input signal, each element specifies a unique initial condition for the corresponding delay element in the corresponding channel. This property applies only when you set the Structure property to one of Direct form II or Direct form II transposed. Specify the initial conditions of the filter states on the side of the filter structure with the zeros. 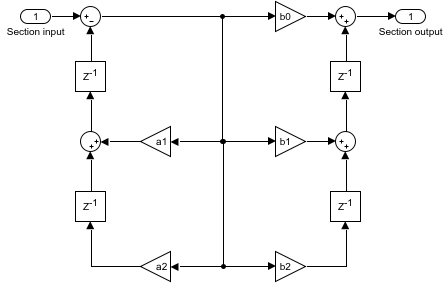 The number of states or delay elements in the numerator of a direct-form I biquad filter equals twice the number of filter sections. You can specify the initial conditions as a scalar, vector, or matrix. When you specify a scalar, the biquad filter initializes all delay elements on the zeros side in the filter to that value. When you specify a vector of length equal to the number of delay elements on the zeros side in the filter, each vector element specifies a unique initial condition for the corresponding delay element on the zeros side. 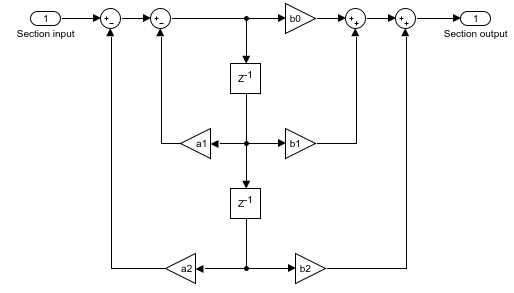 The biquad filter applies the same vector of initial conditions to each channel of the input signal. When you specify a vector of length equal to the product of the number of input channels and the number of delay elements on the zeros side in the filter, each element specifies a unique initial condition for the corresponding delay element on the zeros side in the corresponding channel. When you specify a matrix with the same number of rows as the number of delay elements on the zeros side in the filter, and one column for each channel of the input signal, each element specifies a unique initial condition for the corresponding delay element on the zeros side in the corresponding channel. This property applies only when you set the Structure property to one of Direct form I or Direct form I transposed. Specify the initial conditions of the filter states on the side of the filter structure with the poles. The number of denominator states, or delay elements, in a direct-form I (noncanonic) biquad filter equals twice the number of filter sections. You can specify the initial conditions as a scalar, vector, or matrix. When you specify a scalar, the biquad filter initializes all delay elements on the poles side of the filter to that value. When you specify a vector of length equal to the number of delay elements on the poles side in the filter, each vector element specifies a unique initial condition for the corresponding delay element on the poles side. The object applies the same vector of initial conditions to each channel of the input signal. When you specify a vector of length equal to the product of the number of input channels and the number of delay elements on the poles side in the filter, each element specifies a unique initial condition for the corresponding delay element on the poles side in the corresponding channel. When you specify a matrix with the same number of rows as the number of delay elements on the poles side in the filter, and one column for each channel of the input signal, each element specifies a unique initial condition for the corresponding delay element on the poles side in the corresponding channel. This property only applies when you set the Structure property to one of Direct form I or Direct form I transposed. When this Boolean property is set to true, the biquad filter removes all unity scale gain computations. This reduces the number of computations and increases the fixed-point accuracy. Select how to specify scale values. By default, this property is true, and the scale values are specified via the input port. When this property is false, all scale values are 1. This property applies only when the SOSMatrixSource property is Input port. Specify the overflow action as one of Wrap or Saturate. Specify the multiplicand fixed-point data type as one of Same as output or Custom. This property applies only when you set the Structure property to Direct form I transposed. Specify the multiplicand fixed-point type as a scaled numerictype object with a Signedness of Auto. This property applies only when you set the MultiplicandDataType property to Custom. Specify the section input fixed-point data type as either Same as input or Custom. Specify the section input fixed-point type as a scaled numerictype object with a Signedness of Auto. This property applies only when you set the SectionInputDataType property to Custom. Specify the section output fixed-point data type as either Same as section input or Custom. Specify the section output fixed-point type as a signed, scaled numerictype object with a Signedness of Auto. This property applies only when you set the SectionOutputDataType property to Custom. Specify the numerator coefficients fixed-point data type as Same word length as input or Custom. Setting this property also sets the DenominatorCoefficientsDataType and ScaleValuesDataType properties to the same value. Specify the numerator coefficients fixed-point type as a numerictype object with a Signedness of Auto. The word length of the CustomNumeratorCoefficientsDataType, CustomDenominatorCoefficientsDataType, and CustomScaleValuesDataType properties must be the same. This property applies only when you set the SOSMatrixSource property to Property and the NumeratorCoefficientsDataType property to Custom. Specify the denominator coefficients fixed-point data type as Same word length as input or Custom. Setting this property also sets the NumeratorCoefficientsDataType and ScaleValuesDataType properties to the same value. Specify the denominator coefficients fixed-point type as a numerictype object with a Signedness of Auto. The CustomNumeratorCoefficientsDataType, CustomDenominatorCoefficientsDataType, and CustomScaleValuesDataType properties must have the same word lengths. This property applies only when you set the SOSMatrixSource property to Property and the DenominatorCoefficientsDataType property to Custom. Specify the scale values fixed-point data type as Same word length as input or Custom. Setting this property also sets the NumeratorCoefficientsDataType and DenominatorCoefficientsDataType properties to the same value. Specify the scale values fixed-point type as a numerictype object with a Signedness of Auto. The CustomNumeratorCoefficientsDataType, CustomDenominatorCoefficientsDataType, and CustomScaleValuesDataType properties must have the same word lengths. This property applies only when you set the SOSMatrixSource property to Property and the ScaleValuesDataType property to Custom. Same as input (default) — The numerator product word and fraction lengths are same as that of the input. Custom — Enables the CustomNumeratorProductDataType property, which you can use to specify the custom numerator product data type. Specify the data type as a numerictype object. Full precision — Use full-precision rules to specify the data type. These rules provide the most accurate fixed-point numerics. The rules prevent quantization from occurring within the object. Bits are added, as needed, so that no roundoff or overflow occurs. For more information, see Full Precision for Fixed-Point System Objects. Setting this property also sets the DenominatorProductDataType property to the same value. Specify the product fixed-point type as a scaled numerictype object with a Signedness of Auto. The CustomNumeratorProductDataType and CustomDenominatorProductDataType properties must have the same word lengths. This property applies only when you set the NumeratorProductDataType property to Custom. Same as input (default) — The denominator product word and fraction lengths are same as that of the input. Custom — Enables the CustomDenominatorProductDataType property, which you can use to specify the custom denominator product data type. Specify the data type as a numerictype object. Setting this property also sets the NumeratorProductDataType property to the same value. This property applies only when you set the DenominatorProductDataType to Custom. 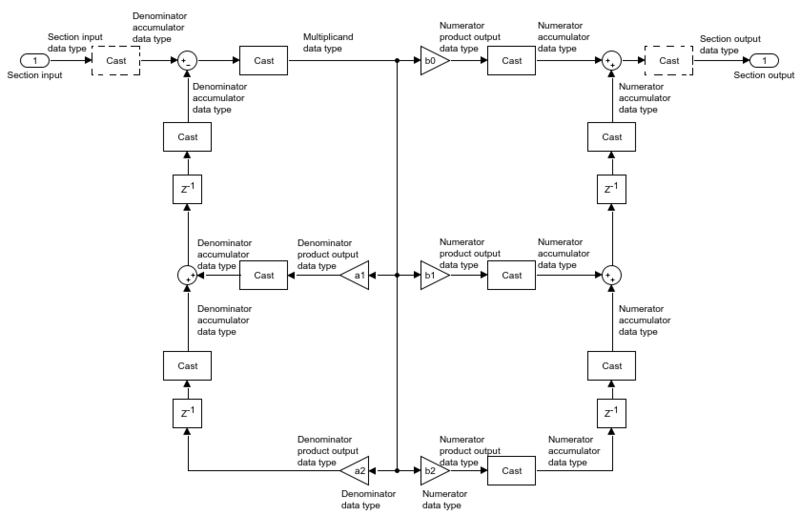 Specify the numerator accumulator fixed-point data type as Same as input, Same as product, or Custom. Setting this property also sets the DenominatorAccumulatorDataType property to the same value. Specify the numerator accumulator fixed-point type as a scaled numerictype object with a Signedness of Auto. The CustomNumeratorAccumulatorDataType and CustomDenominatorAccumulatorDataType properties must have the same word lengths. This property applies only when you set the NumeratorAccumulatorDataType property to Custom. Specify the denominator accumulator fixed-point data type as Same as input, Same as product, or Custom. Setting this property also sets the NumeratorAccumulatorDataType property to the same value. Specify the denominator accumulator fixed-point type as a scaled numerictype object with a Signedness of Auto. The CustomNumeratorAccumulatorDataType and CustomDenominatorAccumulatorDataType properties must have the same word lengths. This property applies only when you set the DenominatorAccumulatorDataType property to Custom. Specify the state fixed-point data type as Same as input, Same as accumulator, or Custom. This property applies when you set the Structure property to Direct form II or Direct form II transposed. Specify the state fixed-point type as a scaled numerictype object with a Signedness of Auto. This property applies only when you set the StateDataType property to Custom. Specify the numerator state fixed-point data type as Same as input, Same as accumulator, or Custom. Setting this property also sets the DenominatorStateDataType property to the same value. Specify the numerator state fixed-point type as a scaled numerictype object with a Signedness of Auto. The CustomNumeratorProductDataType and CustomDenominatorProductDataType properties must have the same word lengths. Specify the denominator state fixed-point data type as Same as input, Same as accumulator, or Custom. Setting this property also sets the NumeratorStateDataType property to the same value. Specify the denominator state fixed-point type as a scaled numerictype object with a Signedness of Auto. The CustomNumeratorStateDataType and CustomDenominatorStateDataType properties must have the same word lengths. Specify the output fixed-point data type as Same as input, Same as accumulator, or Custom. Specify the output fixed-point type as a scaled numerictype object with a Signedness of Auto. This property applies only when you set the OutputDataType property to Custom. y = biquad(x) filters the input signal x , and outputs the filtered values, y. The biquad filter object filters each channel of the input signal over successive calls to the algorithm. y = biquad(x,num,den) filters the input using num as the numerator coefficients, and den as the denominator coefficients of the biquad filter. This configuration applies when the SOSMatrixSource property is Input port and the ScaleValuesInputPort property is false. y = biquad(x,num,den,g) specifies the scale values, g, of the biquad filter. This configuration applies when the SOSMatrixSource property is Input Port and the ScaleValuesInputPort property is true. Data input, specified as a vector or a matrix. This object also accepts variable-size inputs. Once the object is locked, you can change the size of each input channel, but you cannot change the number of channels. The data type of all the inputs must be the same. If the input is fixed-point, it must be signed fixed point with power-of-two slope and zero bias. The complexity of x, num, and den must be the same. Numerator coefficients, specified as a 3-by-N numeric matrix, where N is the number of biquad filter sections. The complexity of x, num, and den must be the same. The data type of all the inputs must be the same. If num is fixed point, it must be signed fixed point with power-of-two slope and zero bias. This input applies only when you set SOSMatrixSource property is Input port. Denominator coefficients, specified as a 2-by-N numeric matrix, where N is the number of biquad filter sections. The object assumes that the first denominator coefficient of each section is 1. The data type of all the inputs must be the same. If den is fixed point, it must be signed fixed point with power-of-two slope and zero bias. Scale values of the biquad filter, specified as a 1-by-(N +1) numeric vector, where N is the number of biquad filter sections. The data type of all the inputs must be the same. If g is fixed point, it must be signed fixed point with power-of-two slope and zero bias. This input applies when the SOSMatrixSource property is Input Port and the ScaleValuesInputPort property is true. Filtered output, returned as a vector or a matrix. The size, data type, and complexity of the output signal matches that of the input signal. Note: If you are using R2016a or an earlier release, replace each call to the object with the equivalent step syntax. For example, obj(x) becomes step(obj,x). 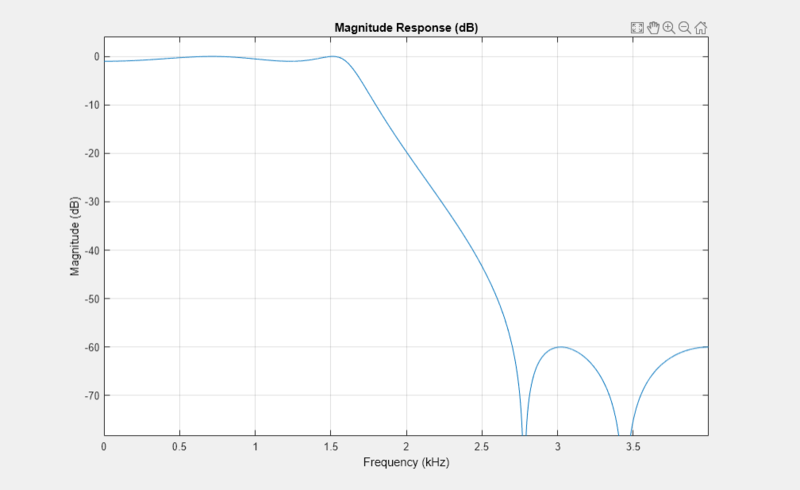 Use a fourth order, lowpass biquadratic filter object with a normalized cutoff frequency of 0.4 to filter high frequencies from an input signal. 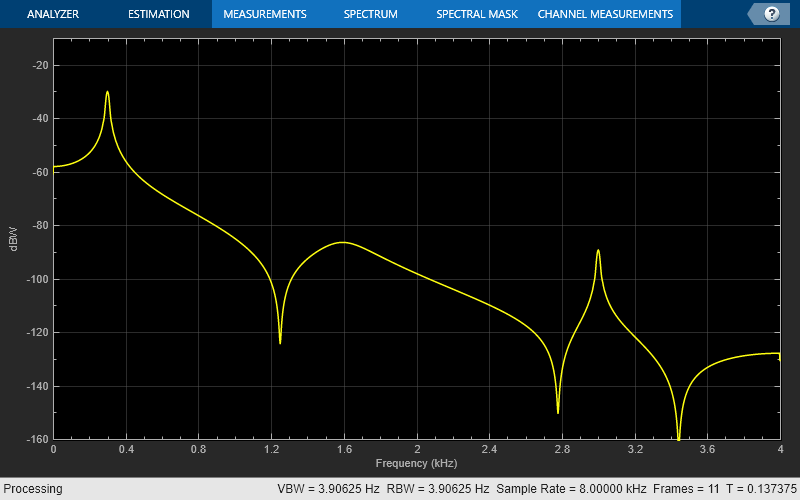 Display the result as a power spectrum using the Spectrum Analyzer. Design and apply a lowpass biquad filter System object using the design function. 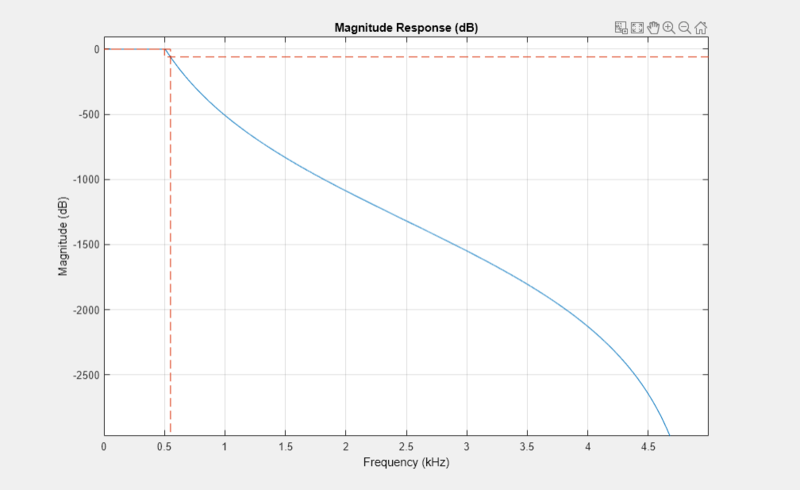 Demonstrate the Linf-norm scaling of a biquad filter using the scale function. Create an options scaling object that contains the scaling options settings you require. Action when the a0 values of the SOS matrix are not one – the biquad filter object assumes the zero-th-order denominator coefficient equals 1 regardless of the specified value. The biquad filter object does not support the Error or Warn options found in the corresponding block. Both this object and its corresponding block support variable-size input. This means that the step method can handle an input which is changing in size. 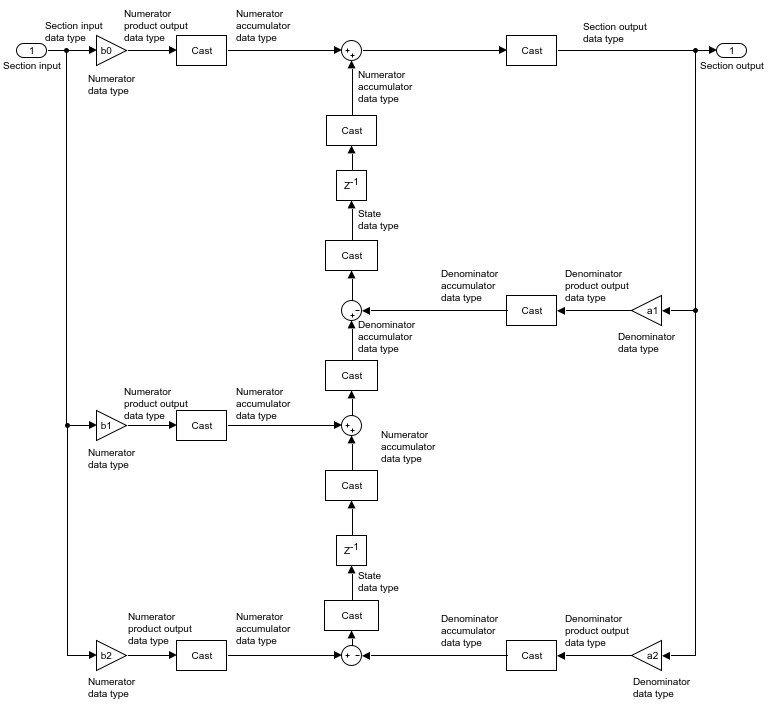 Generate Verilog and VHDL code for FPGA and ASIC designs using HDL Coder™. This object supports HDL code generation if you have the HDL Coder™ installed. HDL Coder provides additional configuration options that affect HDL implementation and synthesized logic. Convert floating-point algorithms to fixed point using Fixed-Point Designer™. The following diagrams show the data types used in the dsp.BiquadFilter object when the input is fixed-point. For each filter structure the object supports, the data types shown in the diagrams can be set through the respective fixed-point properties of the object. The following diagram shows the data types for one section of the filter for fixed-point signals. The following diagrams show the fixed-point data types between filter sections. The dashed casts are omitted when you specify OptimizeUnityScaleValues to true, and scale values to 1.